Bhopal, April 30, 2017 (Ataullah Faizan): Chief Minister Mr. Shivraj Singh Chouhan said that such an arrangement will be made that both Ladli Laxmi and Mukhya Mantri Kanya Vivah-Nikah Yojana will be implemented forever. 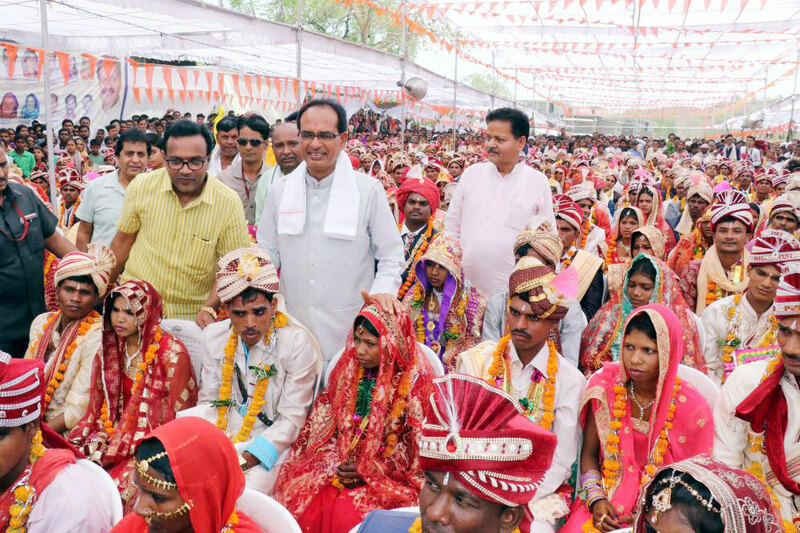 Chief Minister Mr. Chouhan said that a cheque of Rs 3,000 each will be given separately for smart phone to the couples under the Mukhya Mantri Kanya Vivah-Nikah Yojana. Chief Minister Mr. Chouhan. Chief Minister Mr. Chouhan refused to be welcomed at the ceremony venue. The Chief Minister said that – “It’s the marriage of daughters; I am a ‘gharati’ (bride’s side) and will welcome the baratis.” He told the grooms that, “take good care of my nieces otherwise there will be a fight with ‘mamaji’.” was addressing a mass marriage function organized on Akshaya Tritiya inspired by Patai wale Gurudev at Bandrabhan of Budhni development block in Sehore district today. At least 232 girls tied the nuptial knot and one girl performed nikah. Chief Minister Mr. Chouhan blessed the newly-wed couples and extended greetings to all those present at the function on Parashuram Jayanti. District In charge and State’s Public Works Minister Mr. Rampal Singh and Warehousing Corporation Chairman Mr. Rajendra Singh also addressed the gathering. Ram Janam Bhoomi Trust’s National Vice President Swami Atmanand Saraswati, MARKFED Chairman Mr. Ramakant Bhargav, MLA Mr. Vijaypal Singh, Salkanpur Devi Dham Trust Chairman Mr. Mahesh Upadhyaya and many peoples’ representatives were present on the occasion.